I think that’s how you spell that. I was looking for a copy of music that I stole borrowed in college, and went digging through the Suitcase O’ Music. 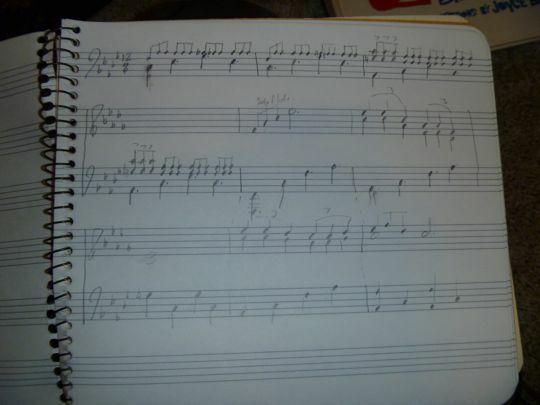 I didn’t find it, but found some stuff from when I was in composition. I was arguably the worst one in that class, and I think it’s because I had grown up as a flute player, and thought in melody lines. Piano people think in chords, so it’s easier for them to figure that stuff out. Sounds plausible, huh? Sounds much better than ‘I was lazy and didn’t know how to apply myself’. Anyway, I found some stuff that I haven’t tried playing yet since I’m rusty and the piano is stuck shut. It’s mostly in minor, because I am a very melancholy soul at heart. I need WARNING before reading such things, man! Now I have hot, sweet tea burning my nostrils and splattered across the office desk. That’s funny, and I never took any of his classes! Why in the world would you compose in a key that has 5 flats????? And don’t even get me sttarted about the time signature. It just occurred to me that you probably just sat down and played this. And, yes, 12/8 is a time signature -- only used by very creative sorts, who like driving the rest of us crazy. I figured it out on the piano first, then wrote it down. I wasn’t thinking ‘five flats’, I was thinking ‘black keys are easy’. Speaking of Dr. Beck, it was his Requiem I was looking for. Anyone have an ill-gotten copy? Kristi’s a musical GENIUS!!!! She will figure prominently in the recital post. What are all those oval shaped black things on your paper? Raisins?